김지영, 이경희,(2015).청소년의 학대경험이 자살생각에 미치는 영향.대한간호과학회지,45(5),752-760. Purpose: The purpose of this study was to examine the moderating mediation effect of self-esteem on the relations among adolescents’ abuse experiences, depression and anxiety, and suicidal ideation. 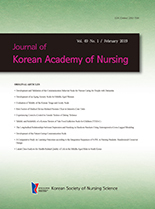 Methods: The participants were selected using secondary data from a population in the 2012 Korea Welfare Panel Survey (KOWEPS). Data were analyzed using SPSS 15.0 and SPSS Macro, and bootstrapping and hierarchical regression analysis were performed to analyze multilevel models. Results: First, analysis of the mediating effect of the adolescents’ abuse showed that there was significant mediating influence between suicidal ideation and depression and anxiety. Second, hierarchical regression analysis showed that self-esteem had significant mediation effect on depression and anxiety in adolescents’ suicidal ideation. Third, SPSS Macro showed that self-esteem also significantly moderated the mediating effect of adolescents’ abuse experiences on suicidal ideation through depression and anxiety. Conclusion: The study results suggest that in future research on adolescent’s abuse experience, the risk of suicide in depression and anxiety scores should be selected through evaluation of each individual’s self-esteem scale. Coping strategies with immediate early intervention should be suggested.